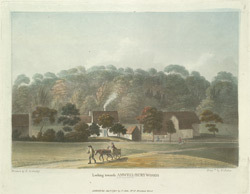 View of Amwell Bury Woods in Hertfordshire by R. M. Barry. Amwell is located on the River Lea (sometimes known as the River Lee) and the first evidence of a settlement here comes from a neolithic burial urn which dates from approximately 2000BC. Since then the town has developed and during the Roman occupation a sizable community grew up near here. Local tradition holds that the name Amwell is derived from AEmma, the wife of King Canute. There was an ancient well or spring here and for many years the area was known as Emmervelle or Emwell, the name Amwell first appears in records in the 13th century.